Comet 67P/Churyumov–Gerasimenko : Where is it, and where will it be. In my previous post I’ve mentions that coment 67P/Churyumov–Gerasimenko is currently between the orbits of Jupiter and Mars, on a trip towards the Sun. While some comets take decades to become visible again this one has an orbital period of 6.44 years, therefore a frequent visitor. That was one of the selection criteria for the target comet: short orbital period such that it did not take too much fuel or planetary gravity assist to intercept. On August 13th it will be at it’s closest position to the sun (perihelion), therefore brightest and a good time to observe. Afterwards it will be swinging back out towards Jupiter on its elongated orbit. 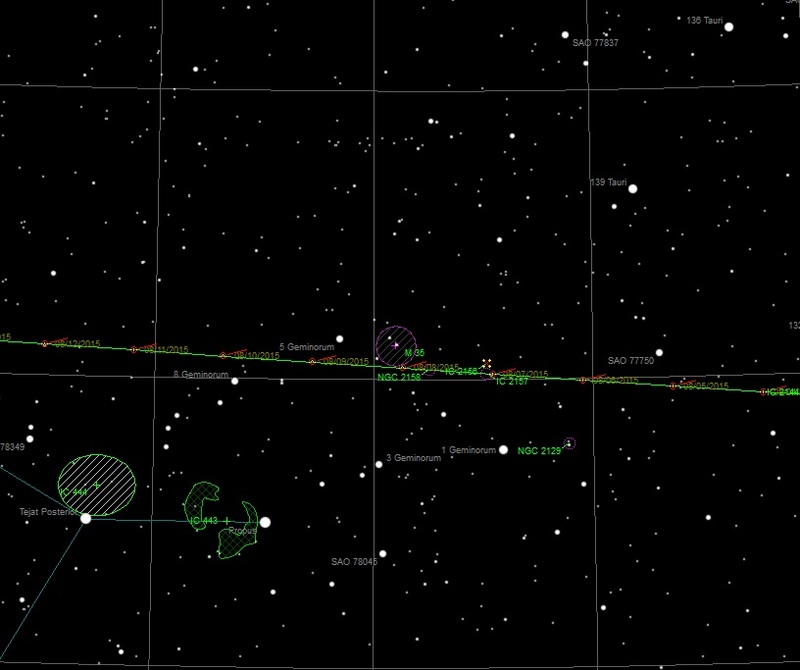 For people in the Northern Hemisphere, the best time to observe comet 67P will be after this August date. 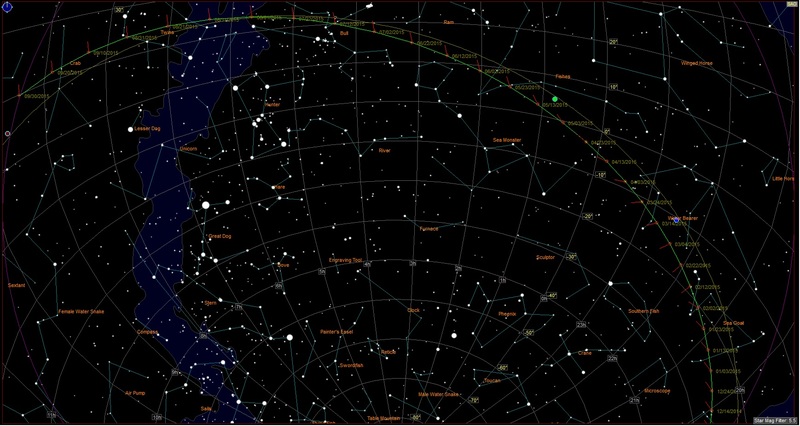 Below is a chart showing that the comet will be visible in the early morning starting in June 2015, and will be visible at higher altitudes in the sky throughout the following months. Comet 67P visibility for around 45 Latitude N.
Below is a chart (click to enlarge) showing the position of 67P until November 15th. A good photographic opportunity will be August 8th when comet 67P will pass right under open cluster M35. This entry was posted in Chart and tagged Astronomy, Comet, M35, Planetarium, sky chart by Benoit Guertin. Bookmark the permalink.